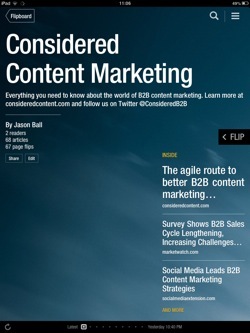 Considered Content Marketing – our own B2B content marketing magazine on Flipboard. I've been a long-time fan of Flipboard – for IOS and Android users, it still sets the standard to beat for news curation and a great reading experience (if only they'd bring a version out for Windows Phone, I'd be a very happy bunny). Well, the guys at Flipboard have been busy and have just launched v2.0 of the app. And for B2B content marketers, it offers a pretty interesting new option for delivering content. With version 2, any user can quickly and easily create their own Flipboard magazines. Curating is fast and intuitive. And the whole thing looks pretty gorgeous too. So, never shy of a chance to play with something new, we've gone ahead and created our own curated magazine for B2B content marketing – Considered Content Marketing. You can find it at flip.it/OiBgq – check it out and let us know what you think. 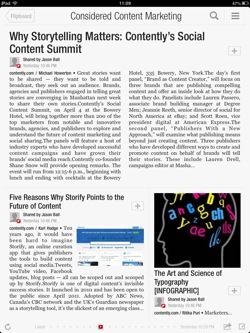 Considered Content Marketing on Flipboard. We're updating the collection every few days, so be sure to check back. Hope you like it. You can also see Flipboard's V2.0 launch video below.